Come check out our new Maximum Weather Station! Thanks to donations from Clambake XXIX attendees and the generosity of our friends at Maximum Inc. in New Bedford, the Lloyd Center is proud to announce the acquisition of a Wireless Blackwatch Weather Station installed on the third floor (Osprey Room Observatory) of the Visitor Center. “We are so grateful to the generous donors and the fantastic team at Maximum that made this possible. 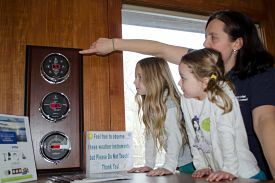 The weather station adds a new dimension to both our education and research programs. We are thrilled to incorporate this real-time weather data into our programs” commented Lloyd Center Executive Director, Rachel Stronach. An additional donation made it possible to purchase software that enables Lloyd Center Research Director Mark Mello, to access and catalogue weather data directly from his computer. The Blackwatch Weather Station includes an anemometer which measures wind speed, direction and maximum wind gust; a barometer which measures barometric pressure, with high/low ratings and rate of change; a thermometer which measures current, high, low and wind chill temperatures; and a rain gage which displays either long- or short-term rainfall at the flip of a switch. The weather station will be utilized for data collection in both the research and education departments.